Every issue, landscape designer Darbi Davis digs deep to bring you stories for your outdoor space. 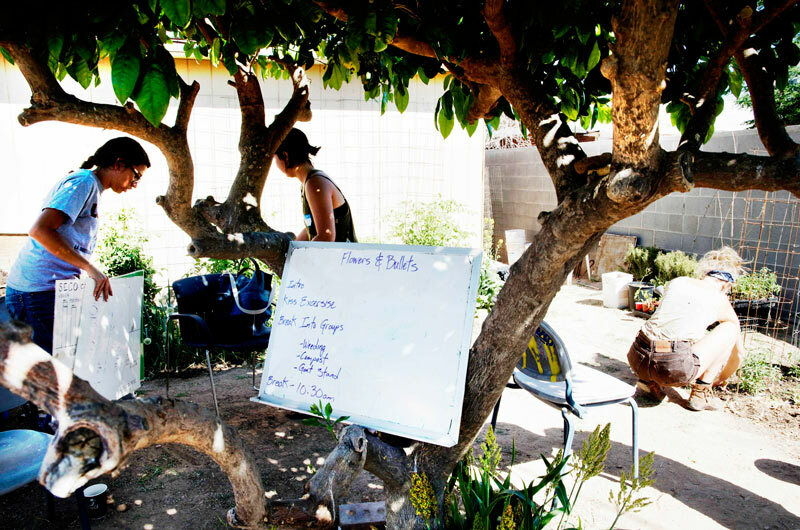 This issue, two young men mix art, rebellion and preservation in a gardening cooperative in south Tucson. It’s a mild April morning in the south-side neighborhood of Barrio Centro. This urban backyard is perfectly appointed with bagels and coffee, three goats, a dog, windows covered with anti-SB 2281 signs, and a crop of over-wintered tomato plants ripe with the season’s first pick. Chairs, tagged – as in the signature of a graffiti artist – surround an old grapefruit tree. Up against the tree is a white erase board with the morning’s agenda and the day’s activities. Today, students from Prescott College’s Social Justice Education class fill each seat around the tree while the neighborhood’s youth – in the form of seasoned young men and women – speak about Barrio life through gardening, and their multi-faceted cooperative known as Flowers & Bullets. Founders Tito Romero and Jacob Robles highlight the history and inspiration of the cooperative while Dora Martinez elaborates on the organizations that helped them (and hindered them) over the last few years. 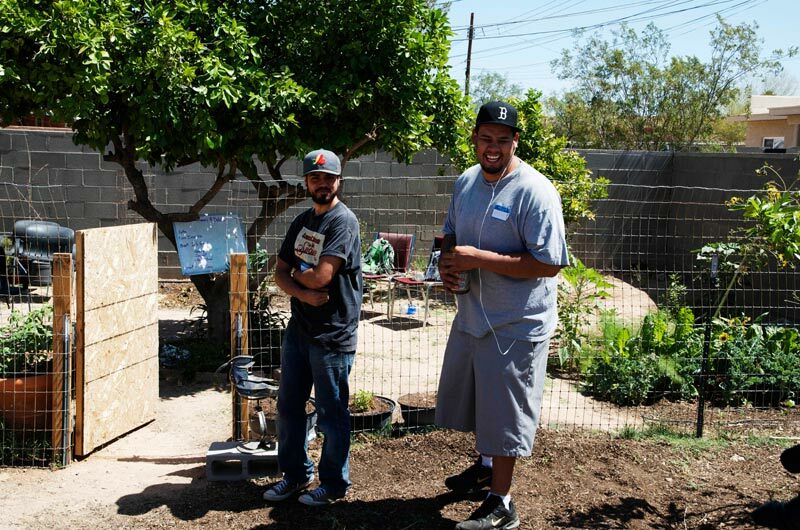 Ramon and Brandon, two more members of the cooperative, are quick to tell stories reflecting the rich history of life in Barrio Centro, as well as show off their own garden plots via smart phone. The day’s tasks include: goat stand construction, compost, and weeds. Each student is randomly handed a name tag containing a tiny vegetable drawing in the corner that indicates the task to be tackled, and the group breaks out to work. Struggle, resistance, empowerment and preservation all unfold in this gardening cooperative. Flowers are the art, say its founders. Bullets are the struggle. Gentrification of their neighborhood – the very neighborhood they grew up and still live in – was the primary catalyst for Tito and Jacob when they started their project. “The city split our neighborhood in half through neighborhood associations [groups of homeowners or business owners living within a specified boundary that advocate for improvements to the area]. As young people who grew up in Barrio Centro we’ve known the boundaries as 22nd Street to the north, Tucson Boulevard to the west, and Alvernon to the east. As a result, the [division] has given power to folks who have little ties to the younger generations or the much, much older generations of families who have lived in the neighborhood for years,” explained Tito. 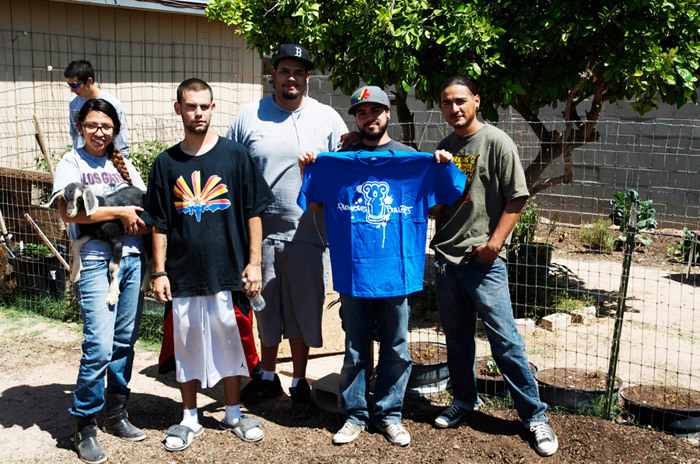 After the split Tito and Jacob, residents of the eastern division, attempted to work with the Barrio Centro Association, which manages the western divide – Country Club to Tucson Blvd. But they were greeted with opposition and removed from the association’s email list. But Dora, an employee with the Community Food Bank of Southern Arizona and a member of Flowers & Bullets, remained on the list because of her food bank email affiliation. It was later revealed by the Barrio Centro Association president that anyone associated with Flowers & Bullets was removed because they were thought to be gang affiliated. While the group is not gang affiliated, the simple definition of the word somewhat describes how they operate. “We meet collectively and organize projects within a specific neighborhood,” says Dora. But their organized activities are the antithesis of deviance and a model of creative kindness and compassion. Tito and Jacob graduated from the now banned Mexican American Studies program – a culturally relevant curriculum offered to any student within Tucson Unified School District, and a program they credit for encouraging them to better their communities and inspire the desire to share personal stories of culture and history with others. They credit the Hip-Hop movement for providing them with an artistic outlet to express their message. Flowers & Bullets is based on a combination of principles gleaned from both. “Hip-hop helps us stay grounded and reminds us of where we came from. It helps us relate to the people we want to serve and it’s a powerful tool for young people to deliver a message,” says Tito. Members of Flowers & Bullets also participate in programs offered by local environmental justice organizations, such as Tierra y Libertad, Green for All, and the Community Food Bank. Tito and Jacob volunteered or interned with many of these organizations and say: “Many of the experiences gave us the knowledge and confidence to do it for ourselves in our neighborhood.” Dora brings a wealth of information to the table – in addition to her work at the Food Bank – having spent several months interning at Sleeping Frog Farms. As a gardening cooperative, Flowers & Bullets installed eight gardens in two months for residents within the modified boundaries of Barrio Centro – that’s one garden a week. 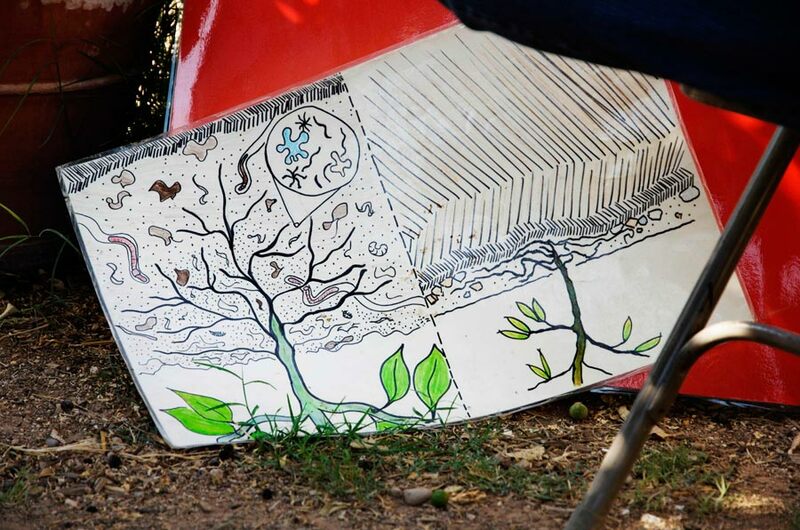 They have a wait list of five additional families ready to participate in a community conversation that includes seed trading, plant starting, and storytelling – all for free and for the sake of their Barrios and their people. The volunteers have accomplished all of this while holding as many as three jobs each – equating to full time work or more. 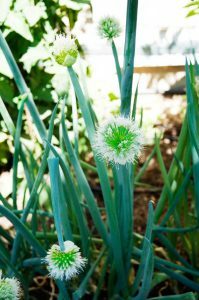 Currently, the cooperative teaches classes on the basic concepts of gardening such as plant care, composting, and the ins and outs of microbial rich soil. The educational component instills confidence in new gardeners leading to a plentiful bounty of homegrown food. In fact, they are often asked to teach outside of their target demographic, which brings us back to that mild April morning around the wise old grapefruit tree in Tito’s backyard. “The students from Prescott were interested in putting in some work and learning what we were about. 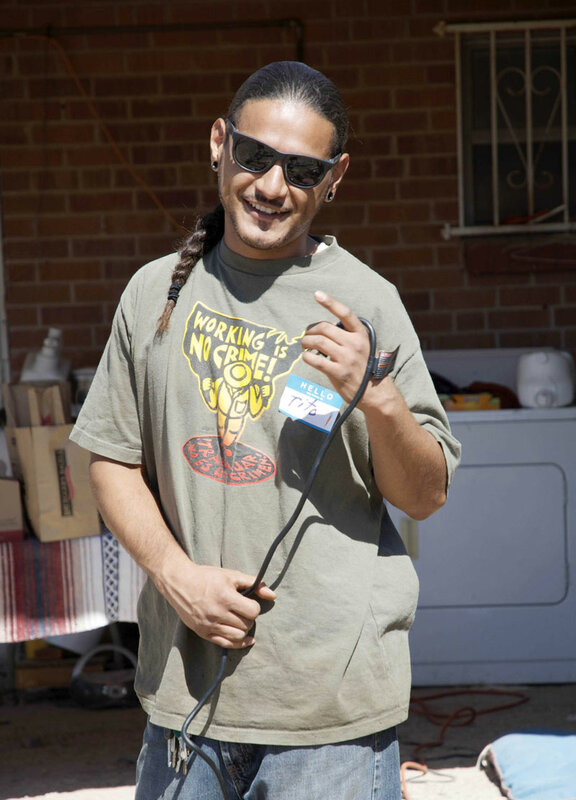 Although it isn’t the demographic we serve, nor people from the neighborhood, it was really great to see the high school push-outs and the university drop-outs teaching college students how to get dirty,” says Tito. Next month: We take a look at how Flowers & Bullets got the gardening buzz, meet the goats, and hear a bit of gardening history from the elders of the neighborhood. * Tucson documentary filmmaker Ricardo Bracamonte, who joins 3 Story as our resident videographer, is following the Flowers & Bullets story. Below he shares a preview of a documentary on the cooperative, due out next summer. Music by Gazzze, a three-piece indie band from Tucson, AZ. For a link to their downloadable EP click here. 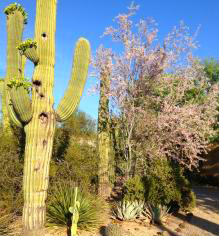 Native to the Sonoran Desert and currently in bloom around town, it’s gray in color with pink/purple flowers followed by bean-like seed pods. It’s a slow grower and a bit pokey, but wow is it gorgeous. See how it contrasts with other natives in the photograph.